Do you want to sell your car or your home? Feeling difficulty to attract customers for your new business? So, dear friends, don’t worry about that. Here’re a lot of sites which are made to place free classified ads. Whatever your requirement and wherever you live in India, you are able to post free classified ads. Every person wants to advertise his/her business for free at very large scale. You can also post classified ads on Newspapers, Magazines and Posters but their scope is limited and you have to pay charge for placing ads there. Posting classified ads on Internet (on a website supporting ads) is the great idea for people want to post advertisement because those can get unlimited viewers for free by posting ads on free classified ads websites. Bedpage.com is the #1 free classified website. Bedpage is the most popular classified website of the United States and recently for India, the site has become free. The site is known as the best alternative of Backpage which was the most popular classified site of the history. We recommend Bedpage as a top classified website. It is an Indian site to post free classified ads. You can post any item by clicking on “Post Free Ad”. It is most popular in India that’s why I ranked it at first position. Oorgin.com is another free classified ad posting website where you can post free classified ads for Indian customers. It has different categories for ad posting such as Housing, Electronics, Jobs, Cars & Vehicles and more. The ease of use and being able to post ads in under a minute are the examples of what I liked about this classifieds. They do have a wide range of categories covered throughout their site and your ads will go live immediately. Go ahead and try it today. It is also an Indian site to place free classified ads for every thing you want. It is a big community which has great amount of viewers. You can search for the desired ad by choosing the appropriate category. It is a free Indian site to place free classified ads for sale something, for jobs, for find real estate and more. We can say that it is the perfect alternative of the above two free ad posting websites. 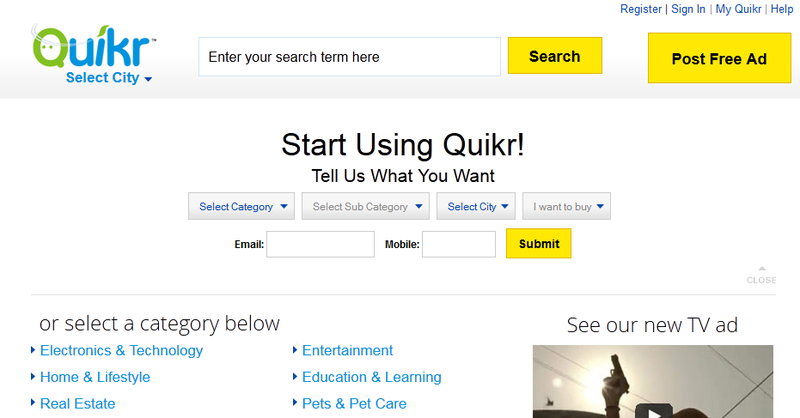 Click.in is also free classified ads website to post free ads in India. It provides you the facility to post and search free classifieds for real estate, jobs, automobiles, services, education, travels and many more. It is also a Indian website to post free classified ads. It’s an another popular platform to advertise your business. You can search and post ads by selecting appropriate city in India. People want to Sell/Buy something, Deals, Home Needs and Office Needs then they can advertise here to show ad to hundreds of viewers of Sulekha Classifieds. It is another an Indian website to post free classified ads in India. It has 3,72,878 classifieds in India that are increasing day to day. It provides very simple navigation to post your free ad. That’s it guys. All of these sites are very high ranked and most popular in India for posting free classified ads. So, if you liked this list of best websites to post free classified ads online in India, then share this article to social networks. Nice info …. Keep writing ! I found many new websites to post free classified ads in India..Thanks for this article. What are good sites in India for machinery? Machines such as shears and lathes and grinders, etc. India’s free classifieds site where you can post free ads and buy sell rent anything for free & it is easy to use just post your free ads & get more buyers and sellers for more details visit www[dot]postadfree[dot]in. Adhoards is a free classified site in India,US,UK covering more than 50 countries.You should check out this. Thanks for the list Raman. Thanks for this good classified listing. I suggest indiaaclick.com should be also in top 10 free classified site. Its really free for business listing across India. Thanks for sharing this post with us….!!!!!!!!! Few days on-wards I searching for new classifieds sites. I got here good list. Thanks for the list. Dear author, I think you have been missed proprover.com – The best real estate classified in Hyderabad. Thanks for sharing nice classified ads sites. You can also post free classified ads on Masig. Thanks for all this important information. Thank you so much for providing the such useful daily classifieds list with high DA and high PR. Really it is very useful for the users who are searching for this. I will like to mention here the India’s new daily classifieds website infonid.com very useful due to it’s exciting features. Thanks again.